Toronto – To say Dr. Miriam Garfinkle practises in this city has a double meaning. There’s the family practice located in her downtown neighbourhood. But there’s another kind of practice she undertakes with dozens of other women. That’s hockey practice. I’'s true that women lacing up the hockey blades is no longer an unusual event. But there’s a delightful deke involved in Dr. Garfinkle’s case. The 43-year-old mother of two didn’t pick up a hockey stick until just a few years ago. And neither did most of the other women, some of them patients, recruited by Dr. Garfinkle to chase the little black rubber biscuit around the rink. But these mature beginners, many in their 40s and 50s, have embraced hockey with unbridled enthusiasm and perhaps appreciate it in a way taken for granted by those who’ve been playing since they were youngsters. “I never thought in a hundred years that I would be learning to play hockey at age 42 or 43. But it’s really added to my life,” said Dr. Garfinkle. “When you get on the ice it’s like floating and gliding. I like the idea of working together as a team and feeling part of the group and I enjoy learning the skills. It’s a whole new thing for me. I’m getting stronger and more physically able to do the things that are required. It’s empowering and it’s fun. And it’s always been symbolic to me of Canadian culture." Her passion is such that she even ignored her own better medical judgment and played while she had pneumonia. Dr. Garfinkle and the others enjoyed this past inaugural season so much that they arranged an eight-week spring training camp with a nationally renowned coach. But she wasn’t always certain hockey was a good sport for her or her family. She was ambivalent when her son, now 11 years old, began playing minor hockey when he was six. The anxiety hit her like a body check when he became a goaltender. Dr. Garfinkle’s husband never played hockey but his son’s involvement led him into coaching minor hockey. Not content to watch from behind the bench, he signed up to play in a league. Dr. Garfinkle knew there must be something to all this enjoyment but still regarded it a “guy thing.” She discovered the secret at the local outdoor rink a couple of years ago. Wearing figure skates, she went to the rink and played shinny with a bunch of local children. She eventually bought hockey skates and then decided to take it a stride beyond by organizing a group of fellow hockey moms and other interested women to rent ice at the local arena last winter for a league of their own. She hoped to recruit at least 15 players but ended up with about 30. Some of those players are patients from her family practice. They decided to use a real puck – the hard variety that truly hurts when it collides with unprotected body parts. As the season progressed, most players began to acquire more of their own equipment – not that they needed the gear because they were hitting each other. They take a polite approach to what can be an aggressive game. “We certainly seem to say sorry every time we get near each other,” said Dr. Garfinkle, who plays defence. After a season of improvised play, some of the women felt they wanted to learn more about basic skills and concepts. They organized an eight-week training session, ending in late June, and enlisted coach Dave McMaster to administer a dose of skills. McMaster coaches a local girls’ house league hockey team. But he also coached Canada’s women's hockey team to its first world gold medal in 1990. 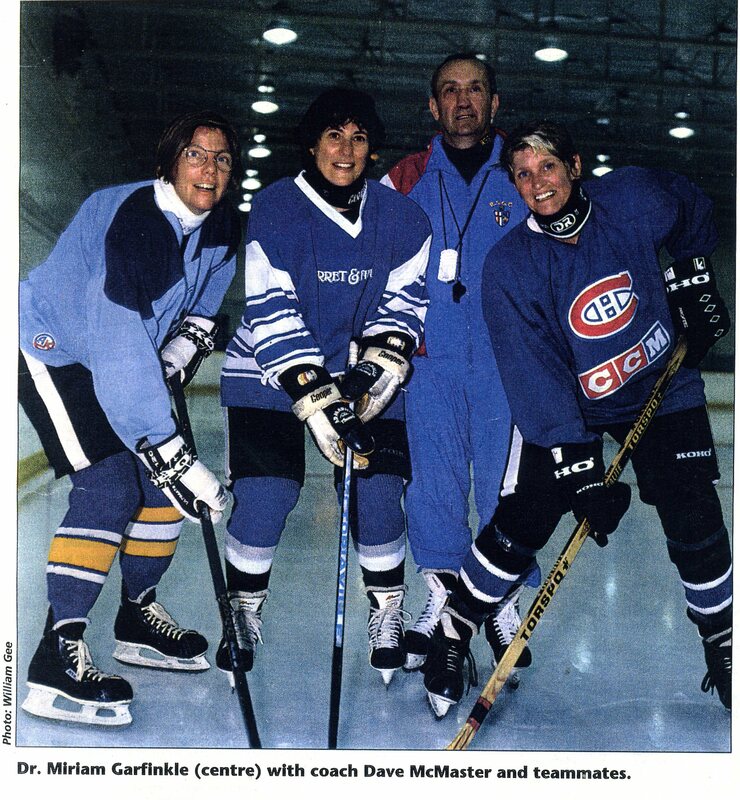 McMaster also coached the University of Toronto Lady Blues for 20 years, during which they won 12 championships. “We kind of did it backwards. We played for a season and then we decided we needed some skills-building,” Dr. Garfinkle said. Now, her whole family is interested in hockey. Her 9-year-old daughter just started playing minor hockey. Even the family dog has been seduced by the game.